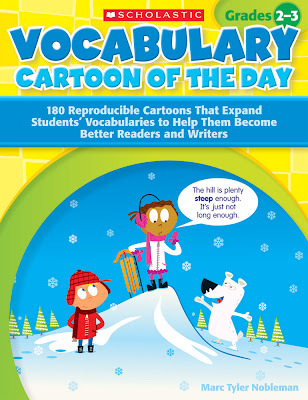 Noblemania: Vocabulary Cartoon of the Day: a prequel? 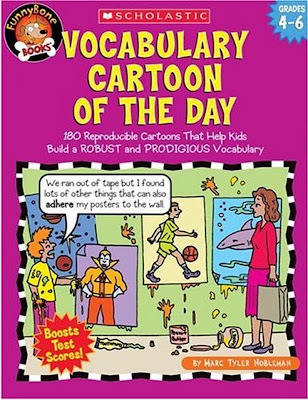 In 2005, the only book I've both written and illustrated came out: Vocabulary Cartoon of the Day (grades 4-6). It was the result of a Scholastic editor I'd already written several books for asking if I'd like to update a book of the same name that had been published during the Space Race. It wasn't that the words defined then were no longer in use and it wasn't that the cartoons were no longer funny (though there was some of that). It was that the cartoons included things that are no longer considered "kid-friendly." Guns. Cigarettes. Sixties hairdos. So I came up with a new list of 180 words and a kid-friendly cartoon built around each of them. No weapons. No carcinogens. No cars, either, but that's just because I don't like drawing boxy things. Then I built a presentation around the book for professional development seminars. For three years, educators asked if I'd do a similar book for grades 2-3. Each time, I passed word to Scholastic. Apparently vocab books were not selling, so each time, they said no. Except the last time. Only this time, I only wrote. My drawing style was deemed not cutesy enough for kids that young, which is sometimes true. They hired cartoonist Mike Moran, and the book looks great. He handled revision requests speedily and graciously. I asked if his name could also be on the cover but that is not house style for this Scholastic imprint. Two other noteworthy differences in this book: one, we provide an index, and two, teachers provided the words. Last year, I put out a call for entries to second and third grade teachers, soliciting words they would like their students to learn; I received hundreds of suggestions. Every vocabulary word defined in the book came from the lists the teachers e-mailed me. So it is co-authored, in a sense, by its audience. As with the first book, I would have chosen a different cartoon for the cover (one in which the gag is more visual), but otherwise, I'm thrilled with how it came out.